Four blasts, including a suicide bombing at the police headquarters, rocked the Egyptian capital and nearby areas in Cairo, killing six persons and wounding nearly 100 on the eve of the anniversary of the 2011 uprising. The first powerful blast was reportedly caused by a suicide attacker, who rammed his explosives-laden vehicle into a security fence around the Cairo Security Directorate, killing four and injuring 76 others, officials at the interior and health ministry said. In a second blast hours later, at least one person was killed when a small improvised explosive device went off near a police vehicle close to a metro station in Giza. At least 11 persons were wounded in the attack. Another improvised bomb hit a police station near the Giza pyramids. The blast did not cause any fatalities, an interior ministry official told state TV. The fourth blast at the Radobis Cinema theatre in Cairo's Haram district killed one person, state TV reported. The deadly blasts raised concerns that an Islamist insurgency is gathering pace in the polarised Arab nation as Egyptian forces have intensified a crackdown on Islamists. The Islamist elements have been blamed for a series of attacks on the army and police following the ouster of President Mohamed Morsi by the powerful military on July 3, 2013. Hours after the bombings, angry mobs along with police clashed with Brotherhood activists, accused by the government of being behind a wave of bombings and shootings. Brotherhood has denied such allegations. At least 10 people, including a school student, were killed while 11 others were injured in the clashes. "It's a vile, desperate attempt by evil terrorist forces to disrupt the success Egypt and its people have achieved in the [transitional] roadmap and the passing of the new constitution," Prime Minister Hazem El-Beblawi commented, in reference to the Cairo bomb. In a statement, president Adly Mansour pledged to "severely punish" those involved in "planning, financing, inciting, participating in or executing" such attacks, saying that tampering with state security is a "red line". An al Qaeda-inspired militant group Ansar Beit al-Maqdis (Champions of Jerusalem) claimed responsibility for the attack on the police headquarters, the BBC reported. 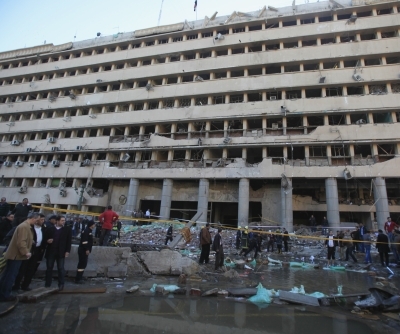 The explosion at the police headquarters blew out the windows of the building and stripped off parts of its facade. The nearby Museum of Islamic Arts was severely damaged by the explosion, which could be heard six kilometres away. State television said investigators had found the remains of the suspected suicide bomber. A witness said she saw a badly mangled vehicle stained with blood parked in front of the police compound. TV footage showed dense smoke billowing from the building after the blast. The police have cordoned off the area. The blasts came on the eve of the third anniversary of the 2011 uprising that ended the three-decade long autocratic regime of Mubarak. "They don't want the people to to celebrate," the January 25 anniversary, Interior Minister Mohamed Ibrahim said of the attackers. Meanwhile, supporters of ousted Islamist President Mohamed Morsi squared off with police and local residents in the Nile Delta's Damietta governorate. Twelve protesters were arrested during the violence, Ahram Online reported. Clashes also erupted in Alexandria during a funeral for a student killed in violence in the city on Thursday, leading to the death of another protester. Supporters and opponents of the Brotherhood threw bricks and stones in the Al-Dekheila district. Fierce clashes also broke out in Giza between Morsi supporters and Egyptian security forces. Hundreds of Islamists gathered in the Imbaba district, west of Cairo and clashed with security forces, who responded by firing tear gas, MENA news agency reported. One person died in the Imbaba clashes. At least 111 rioters have been arrested in several governorates, the interior ministry said. In Beheira governorate in Egypt's Nile Delta, two were killed in clashes between the Brotherhood and residents of Housh Eissa city. In Upper Egypt's Beni Suef governorate, the health ministry reported that two people were killed during clashes. Protests had erupted following Friday prayers in the cities of Beni Suef and Al-Wasti which soon after developed into confrontations. In Upper Egypt's Minya governorate, a shop owner died from gunshot wounds sustained as he was passing close to the clashes. One more was injured, according to a health ministry. Three more people, including a school student, were killed in the violence, officials said. There have been calls from three different groups to take to streets on January 25. All calls target Tahrir Square as a final destination and as the anti-protest law has been activated, it is expected the three groups should request permits in advance.